There are over 20 Fireballs at Draycote, with most taking part in the racing. 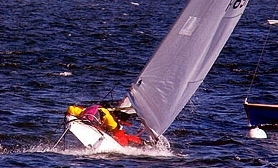 The fleet is very active and is one of the largest in the club. We reckon that there are about 50 Fireballers in total, ranging from 19 to 70 years old and 8 to 16 stone in weight. We started out with old boats, but there are now a lot of White Winders in the fleet. And when the open-meeting circuit hotshots turn up we can generally give them a pretty good run for their money. But we haven't forgotten where we came from, and you can still race your old composite or wooden boat in good company here. We run 'A' and 'B' fleet racing so you don't have to compete with the cheque-book mob. Although, if you are any good, you'll probably beat a lot of the white items anyway, as most of our sailors are, er, not exactly world champion material. That's cool - we don't want to take this stuff too seriously. We are here to have fun racing Fireballs rather than indulging in any of the other nonsense. If you are considering sailing a Fireball at Draycote, get in touch or come and pay us a visit - you can be sure of a warm welcome. Special offer - we pay your joining fee! Ex fleet-captain Helen and some bloke called Pete practising their capsize drill. Note how the woman is doing all the work, while the bloke just stands about with his hands in his pockets. Helen leaps nimbly aboard. Pete is already asleep in the spinnaker bag.